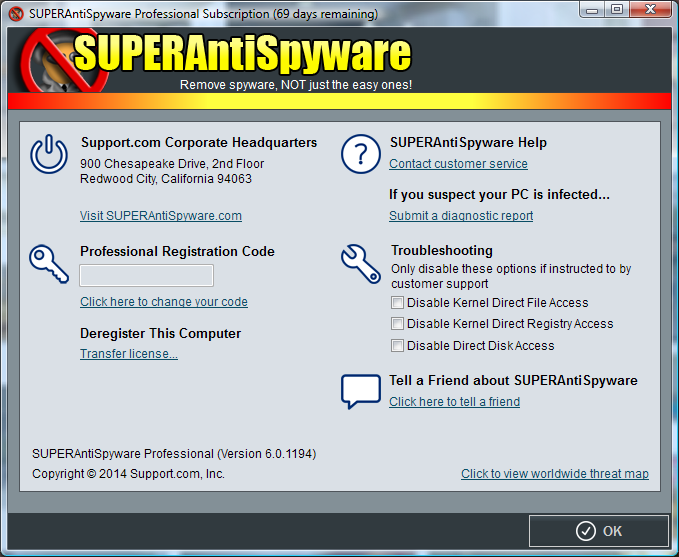 SUPERAntiSpyware FAQ - My registration code doesn't work. When I try to register, SUPERAntiSpyware shows the error message "The number of valid licenses for the registration code you entered has been exceeded. Please contact our support staff." What do I do? My registration code doesn't work. When I try to register, SUPERAntiSpyware shows the error message "The number of valid licenses for the registration code you entered has been exceeded. Please contact our support staff." What do I do? This happens when the registration code has been used on multiple computers. See the document "I have more than one computer, do I have to purchase SUPERAntiSpyware Professional for each of them?" for more information about how many computers your SUPERAntiSpyware Professional license covers at one time. To transfer your SUPERAntiSpyware Professional license from an established installation, click the "Help and Information" Button, and click on "Transfer License". Follow the prompts to complete the transfer, and click the "Ok" button. You will now be free to register on a new computer.